Japanese designer Masaki Matsushima has launched Matsu, a new fragrance for women. "Matsu" opens with a fresh, floral breeze of velvet peach accents and a touch of pink pepper that evolves into a spicy and green, herbal note. These subtle notes reveal a rich, blossoming wisteria bouquet, lilac, jasmine and orange blossom, which unleash very bright and fruity facets. Like a stroll in springtime through a garden full of flowers, "Matsu" dances circling in the wind and gives off a powdery touch with its musky base, pleasantly wrapped in sandalwood and coupled with sweet almonds. 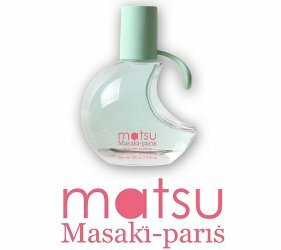 Masaki Matsushima Matsu is available now at First in Fragrance in Germany, in 40 or 80 ml Eau de Parfum. I like bottle a lot. And the colour. The notes not so much. The bottle looks japanese and grabable in a modernist way. They do fun bottles! But yes, haven’t loved any of the scents yet.